Are you kidding me? 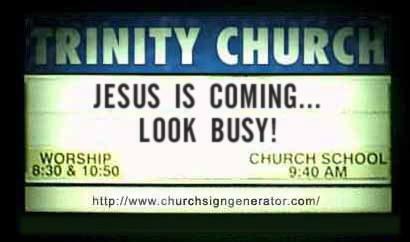 Are you now beginning to see why my hindquarters are chapped over church signs? 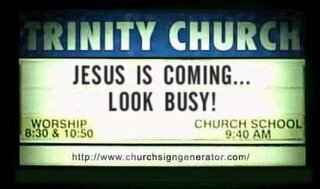 I actually saw this one on a church sign in my neighborhood. In fact, it was the very church where I was pastoring at the time. When I drove by and saw it, I was horrified and immediately changed it, which went over like a you-know-what in church. At the time, the deacons took turns each week changing the sign. The fellow who's turn it was to change the sign on this occasion obviously possessed a "works" mentality and not one of grace. In his arrogant opinion, if you were not working in the church, you were "useless" (a direct quote). I blatantly disagreed, and continually proclaimed a message of grace and acceptance. People do not come to church looking for a job, they are looking for Jesus, and did NOT see it in this man's life. Sadly, the author of this sign became one of the largest thorns in my side in this church. He finally left after three very unsuccessful (and one very ugly) attempts to run me off. Unfortunately, he had planted many seeds of discord before his departure from the flock that exist even today, nearly 2 years after my own departure. For the record, I took over the "Sign Ministry" at the church after this incident with very few objections. Churches turned me off forever when they started in on their current anti-gay shtick. They now focus on hate and money instead of love, and I am sure Jesus would tear them all down for that if he returned today. naah - too much generalization on the "anti-gay schtick" thing. a few churches and church people have messed up, but as a whole it's still the best way to live life. "love God, love others" is rich with meaning, and might be one of the few church signs that would get it right somehow.